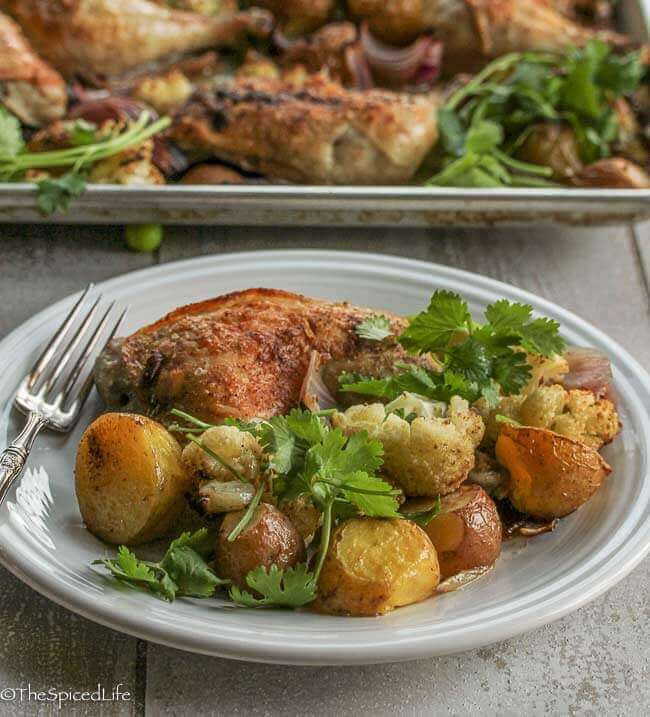 Chaat Masala Chicken, Potato and Cauliflower Sheet Pan Dinner is the answer to every question there is about weeknight supper. Fast, easy, healthy–and incredibly tasty. I am running waaaaay behind–which is actually a good thing because it means the dishes I am sharing were photographed in natural light. Maybe I can stretch the remaining dishes out until the sun comes back. Anyway, one of the consequences of running way behind is that I have forgotten to share some big events. Namely that we lost Delilah this past fall. So for the past three and a half months we have been a one dog household. She was an agoraphobic (truly, weirdly) bed hog who never met a baby or child that she didn’t love. 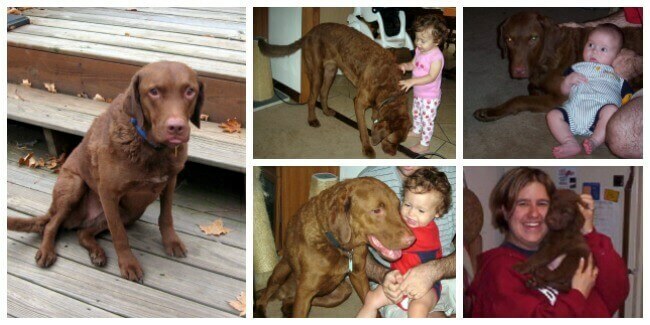 She was my baby and I miss her every night. Which leads me to… Guys! I have exciting totally non-food related news! It starts with our cruise, during which Skamp, who had never been left without another dog for that long and kind of had a nervous breakdown. So we decided that we would become a three dog household–and if you are counting, yes we are technically a two dog household. But we have a deposit in on a German Shepherd puppy who is yet to exist. So John agreed maybe we should look at medium breeds who don’t shed much. 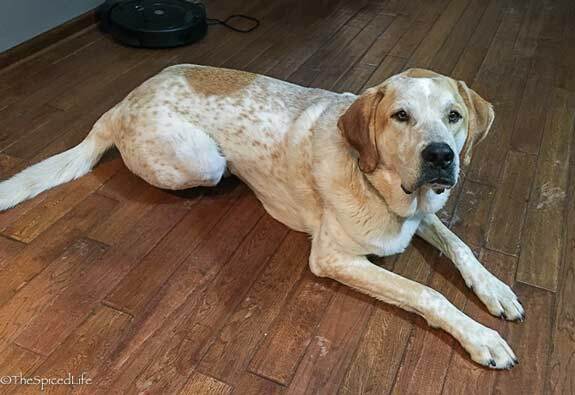 Meet Roger, half Great Pyrenees, half Hound mutt, approximately 100 lbs of lovable shed-monster! He came to us through my family–he needed a big yard (which my mom has) and kids (which my sister has)–but we have both. We love him already despite my sister naming him Roger Dorn after the character in Major League, and Skamp thinks he is the bomb. (Skamp has been waiting his whole life for a dog to play outside with him.) So far Persephone thinks he has been sent to torment her, but truly she has not even let him get a look at her yet. Despite coming from a hunting dog household, Roger has not shown any signs of aggression, more just bumbling curiosity–which that cat is not indulging! OK, having gotten both lousy and wonderful family news out of the way, about this sheet pan dinner. I am super proud of having the idea to transform Chaat Masala Roasted Cauliflower into a sheet pan dinner. Much like that stupid simple but stupid good recipe, this one is also ridiculously simple–and ridiculously delicious. And much like all super easy recipes, it left me wondering: why didn’t it occur to me to do that sooner? 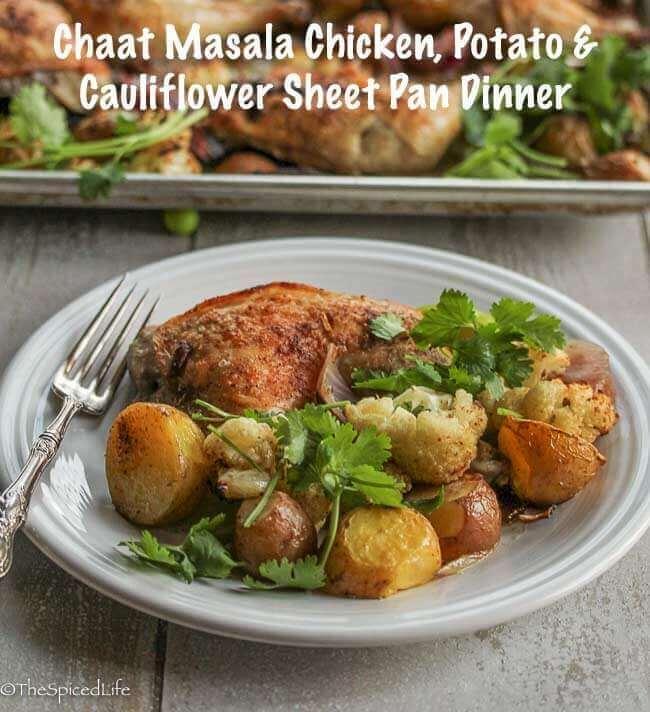 We’ll never know–but trust me and get into the kitchen and make this Chaat Masala Chicken, Potato and Cauliflower Sheet Pan Dinner. 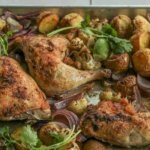 This recipe makes 2 sheet pans of food. Cut it in half for 1 sheet pan only. A lot of my amounts were dictated by what I had around--feel free to adjust to more or less potatoes or cauliflower, just be certain that the ingredients can lay in one layer on the sheet pan and not be overly crowded. I got the idea for this dish from our love for Chaat Masala Roasted Cauliflower. Melt the ghee and then whisk it with the vegetable oil. Use more vegetable oil if your sheet pans are not nonstick. If your pans are not nonstick, brush 1 1/2 teaspoons of the oil-ghee mixture onto each pan. Brush a little of the oil-ghee mixture onto the chicken skin. Rub with sea salt and a hefty pinch of chaat masala per chicken piece. Remember that the chaat masala has black salt in it, so do not go overboard with the sea salt. Drizzle half of the remaining oil-ghee mixture over the potatoes in a large bowl and toss them. Sprinkle with a hefty pinch of sea salt and 4-8 teaspoons of the chaat masala. Spread the chicken pieces (skin side up), potatoes and onion wedges out over the 2 baking sheets. Roll them around a bit to help distribute the oil-ghee. While the chicken is baking, place the cauliflower florets into the bowl that held the potatoes. Drizzle them with the remaining oil-ghee and toss. Sprinkle with the remaining chaat masala and a hefty pinch or 2 of sea salt. After the first 20 minutes, add the cauliflower to the baking sheets in the spaces in between the potatoes and chicken. Return the sheets to the oven, rotating front to back and top to bottom. Roast for another 15-25 minutes, until the chicken registers 160 F and the potatoes and cauliflower are nicely browned. Serve garnished with cilantro sprigs and lime wedges. Laura I just found your blog and suspect I will be trying a lot of your recipes! 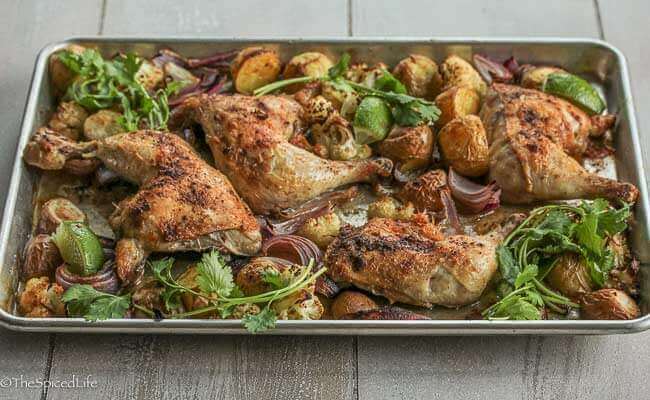 I like to use parchment paper for easy cleanup – any reason not to use it for sheet pan dinners? I don’t think so–although I might reduce the amount of oil used. Report back and let us know but I will be surprised if you have any problems! Yes I think you would!